Home → Basement Mold → How Can I Fix the Cracked, Bowed Basement in My Syracuse, NY Home? Many people find that the basement in their home is the most problematic area of their house. That’s because the basement is most prone to damage from water sources and gravity. A damp basement is a great place for mold, mildew and bacteria to flourish. Not to mention, in New York State we have humid summers and freezing cold winters. 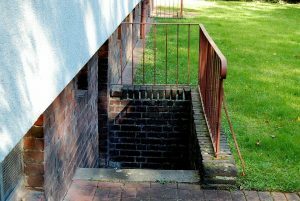 The weight of your home itself on the foundation, coupled with the constant expanding and contracting of the ground around your home, can soon lead to basement wall issues. If the basement wall in your home is showing signs of bowing and cracking, you need help. Luckily, Syracuse, NY homeowners in need of foundation repairs can count on Basement Waterproofing, Inc. to help. We provide the expert services you need to ensure that your foundation is strong enough to withstand the elements. We want you to enjoy a safe, worry-free environment, which is why we offer a number of foundation repair services. Getting foundation repair for your Syracuse, NY home can be stressful. Needing foundation repair can be a source of stress for many homeowners. They probably worry about the costs, and if their home is damaged beyond repair. Furthermore, they may wait too long to get the repairs, only to have to call someone in because a smaller problem has become an emergency. At the first sign of foundation damage, it’s imperative for homeowners to call a reliable company in to help. So if you’ve noticed you need foundation repair for your Syracuse, NY home – don’t wait. Call Basement Waterproofing so we can check out the issue and get you the help you need. We use a patented system to repair the leaky foundation of your Syracuse, NY home, so that your basement gets dry – and stays dry! We offer many services for repairing your basement and foundation walls, depending upon your specific needs. Using the Fortress Wall Stabilization System, we’ll fix your basement walls so that they’ll be sturdy, safe and secure for years to come. Using the Durawall system, we’ll help repair the foundation in your Syracuse, NY home and free your basement from mold, mildew and bacteria growth. We remove the mold from your basement using anti-mold spray guaranteed to kill everything up to and including the H1N1 virus. What’s more, we make the necessary foundation repairs to ensure your basement won’t have mold problems in the future. When you need foundation repair for your Syracuse, NY home, we can help. Let BWI talk to you about the many ways we can assist you. For your convenience, we’re fully staffed during normal working hours to answer your calls – call us at (800) 439-4951, and we’ll be glad to help.